Hot on the heels of releasing two amazing EPs in the first half 2016 - namely Do We Go It Alone? on tenzenmen and I Know I'm In Flames on Sonic Masala, busy Australian band Agency are set to hit the road in support of their work over the next week. Besides playing a pair of shows in Brisbane this weekend, the DIY noise-rock, post-punk indie experimentalists will also be heading to Melaka, Penang and Kuala Lumpur in Malaysia, before wrapping up their Southeast Asian escapade right here in Singapore. Promoted by local arts and music collective Dunce (who've brought in Raus, Dirgahayu and Spartak in recent times), Agency's tour finale will take place at Peninsula Shopping Center's The Music Parlour. The intimate show will also feature up-and-coming art-rock duo Are, who (much like the headliners) recently also dropped a pair of incredible records - a psychedelic, noise-drenched six-track self-titled debut, alongside From The Second Floor Of Life, a four-track acoustic EP recorded while on tour in Osaka and Toride City. And last but not least, Adel Rashid, guitarist for Amateur Takes Control and I Am David Sparkle rounds up this fascinating bill with a rare solo set. 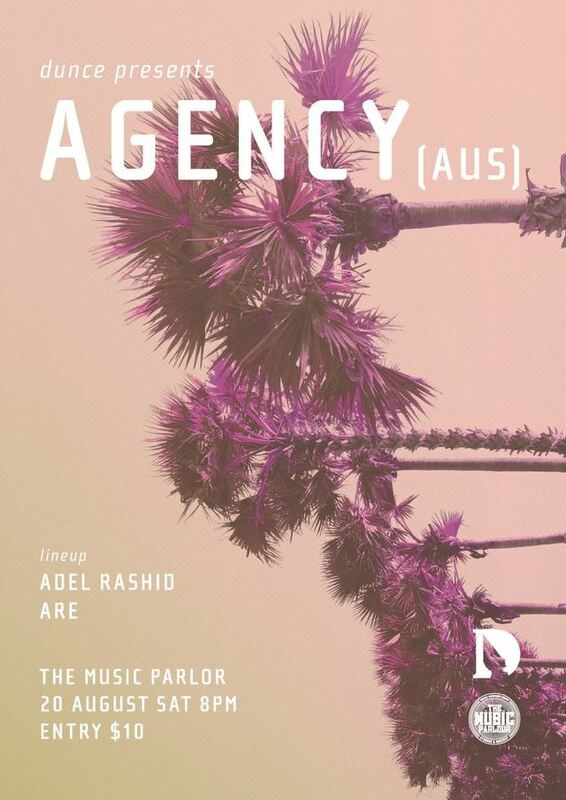 Dunce presents Agency takes place at The Music Parlour on Saturday, 20th August at 8pm. Entry is only $10 at the door.